Mut was the Egyptian goddess of the sky, the divine mother goddess and Queen of the Goddesses. With her consort Amun and son, Khonsu these three gods were named the Triad of Thebes. Egyptian Name: Mut, her name means "mother." 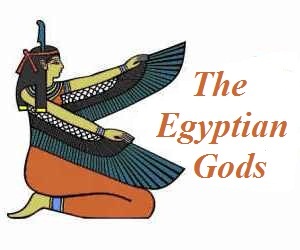 Mut, the Egyptian goddess of the sky, featured in the stories, myths and legends in Egyptian Mythology. She was the Egyptian sky goddess, world mother and the consort of Amun-Ra. She was considered to be the mother of the gods and Queen of the Goddesses. She was depicted as a vulture or with a vulture head-dress and her symbol was the uraeus rearing cobra. Mut 'absorbed' the aspects of two earlier goddesses, Wadjet and Nekhbet who together were referred to as the 'Two Ladies' and symbolized the unification of Egypt. Wadjet was originally the goddess of the red crown of Lower Egypt (north) and Nekhbet was the white vulture goddess of the white crown of Upper Egypt (south). 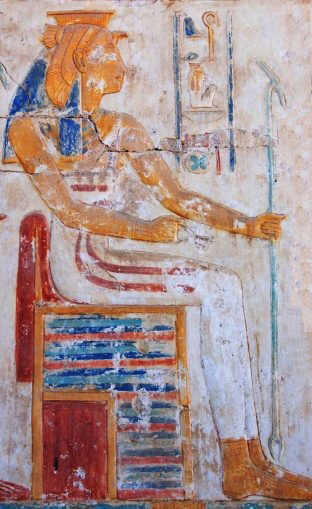 Following the unification of Upper and Lower Egypt Wadjet was paired with Nekhbet, the white vulture goddess and the goddesses were referred to as the "Two Ladies". The symbols of Nekhbet and Wadjet were 'adopted' by Mut. 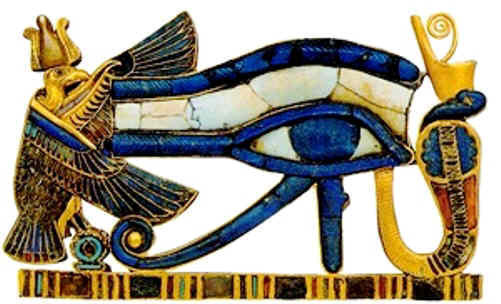 Depictions of Nekhbet and Wadjet are shown on this famous image of the Eye of Ra. The Uraeus was the rearing cobra emblem and a potent symbol of the Pharaohs of Lower Egypt. The uraeus appears as a symbol of a rearing cobra worn on the royal crowns and headdresses of Egypt. The Uraeus conveys an image of a cobra rising up in protection and was an emblem of supreme power and authority in ancient Egypt. Mut is depicted wearing the Royal Vulture Crown consisting of a falcon feather headdress with its wings spread round her head in the act of protection, adorned by a Uraeus. The vulture symbol of Mut represented many different things. The white vulture of Egypt was considered to be a highly maternal and protective bird. The vulture was also immensely powerful and was seen soaring to the heavens associating the bird with the gods. The wide wingspan of the vulture was seen as all-encompassing, and just as the royal vulture crown indicates was protective. As Thebes rose to greater prominence in ancient Egypt, Mut absorbed aspects of other goddesses. The practice of creating new gods by combining them with old gods is called 'syncretism', which meant the fusion of religious beliefs. Mut was merged with Mafdet, Wadjet, Bastet, Menhit and Sekhmet, who were all warrior lioness goddesses. The following ancient picture of the goddess Mut shows her vulture protected headdress, on top of the headdress is small modius which was a crown base used to attach extensions to crowns such as long ostrich feathers. In one hand she holds the Ankh, as a symbol of her power to give life or take it away. In her other hand she holds the 'Was Scepter' a symbol of divine power and an emblem of authority. Mut was a member of the three gods referred to as the Triad of Thebes. The sacred Triad of Thebes consisted of Mut, her consort Amun and their son, Khonsu. Temples and shrines dedicated to the worship of the three gods in the Triad of Thebes existed throughout Egypt, however their cult center was at Karnak, part of the ancient city of Thebes, with its massive temple complex. Major construction work on the massive temple complex during the Eighteenth dynasty, of the period in Egyptian history called the New Kingdom (1570 BC - 1070 BC), when Thebes became the capital of the unified Ancient Egypt. The center of the worship of Mut was a district of Thebes called Asher (Ashrel). Her temple, Het-Mut, was south of the temple of Amun-Ra. The worship of the gods in the Triad of Thebes was halted temporarily by the edicts of the pharaoh Akhenaten, who was the father of Tutankhamen. Akhenaten started a religious revolution in Egypt by banning the worship of all gods including Mut, in favor of just one god - the Aten. During the period of the religious revolution Akhenaten used the Egyptian military to destroy the old religion, all of its gods, including Mut. Akhenaten also tried to destroy the powerful priesthood of the Triad of Thebes. The Temple at Karnak in Thebes and dedicated to the triad of gods was closed, the priests were thrown out and Pharaoh Akhenaten ordered the statues of the old gods to be destroyed. The revolution lasted for 16 years from 1349BC - 1333BC until the abdication and death of Akhenaten. The worship of the Triad of Thebes including Mut was re-established and grew into great prominence. 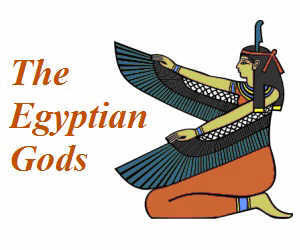 Discover interesting information and research facts about Mut, the Egyptian goddess of the sky. The facts about Mut provides a list detailing fascinating additional info to increase your knowledge about Mut in Egyptian Mythology. Fact 2: She was the wife of the god Amun and the mother of the moon god Khonsu. Together the three gods were called the Triad of Thebes. Fact 4: The female pharaoh Queen Hatshepsut had the ancient temple to Mut at Karnak rebuilt during her rule in the Eighteenth Dynasty of the New Kingdom and claimed that she descended from Mut.